I think I audibly squealed when I saw it, which isn’t normally a thing I do…but if this isn’t squeal-worthy then I don’t know what it. It’s just so pretty. Also, I was a little in awe of the guy up at the top. 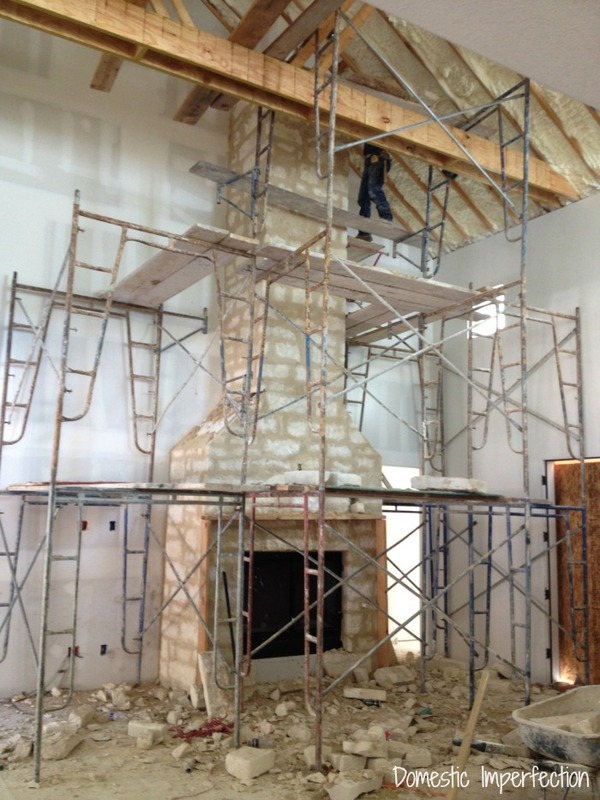 I mean….he’s up there, and he has to haul heavy rocks and mortar up there with him. No thank you. The next day I came back to check the finished product, which was pretty much amazing…except for one tiiiiny little detail. The mantel was really high. It’s hard to tell from the picture because there is nothing to compare it too (I would have taken one with me in it but I was there alone), but it was about 2 feet over my head. Actually, see that doorway on the right? That is an 8 foot doorway, and the mantel is almost as tall as it is. After going back and forth about what to do Adam and I decided to ask the rock crew to lower the mantel the next time they were there. That’s not all we ended up putting rock on though, as a somewhat last-minute decision we decided to go ahead and have them do the main wall in the master bedroom. It was pretty much the perfect place for it, plus it would satisfy that rock wall craving we had going on. Here is something I didn’t know before building a house… when you when you see a home with a masonry, the rock isn’t actually touching the house (usually…I’m sure there’s plenty of exceptions). The rock is it’s own, self-supporting wall. I had just assumed it was mortared to the wall (like I did on the wall in my guest room), but I was wrong. It is attached to the wall every so often with a little metal brace, but other than that it’s just standing there on it’s own (they did it the same way on the outside). I’m sure there is a great reason why they do it like that, but I have no idea what it is. Anyway, here is the finished product. It’s amazing and I can’t believe it’s in my house. I love the thick “German Smear” mortar, it’s much thicker than on the outside of the house and I like it much better. To get it that way Adam and I had to stop worrying about being “those people” and stand over their shoulders saying “more, more, more..” until the mortar was just how we wanted it. Sometimes you just gotta. 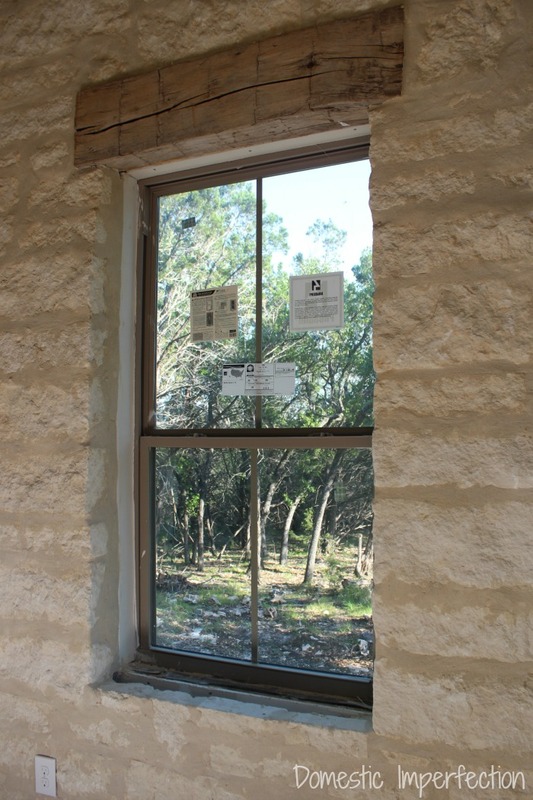 We still have a few finishing touches to put on the wall, like figuring out windowsills and what to do about the drywall that shows around the windows. 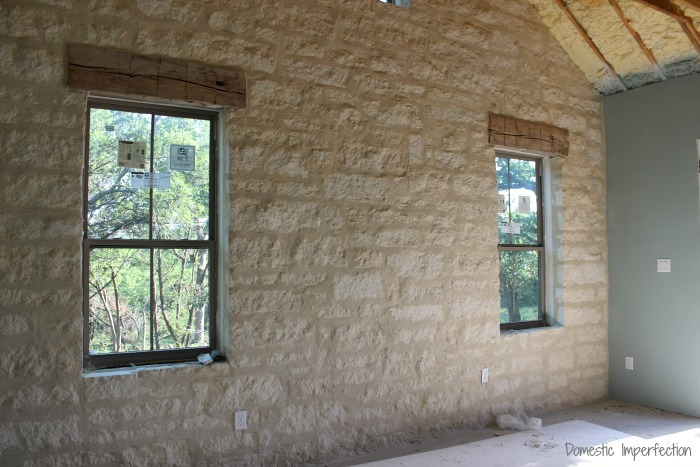 I’ll probably just paint the drywall to match the mortar so that you don’t notice it, and the windows sills will most likely just be white wood. 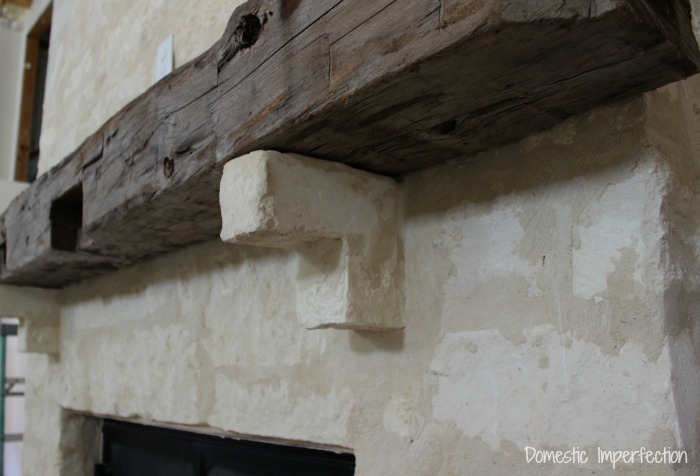 We thought limestone slab sills would be cool (like on the fireplace hearth), but they would be too thick add the windows wouldn’t function. So wood it is. So, price….I know y’all are probably wondering how much dough we sank into this because it looks expensive. Truth be told it was much more affordable that we thought it would be, each one (the fireplace and bedroom wall) cost a little over a thousand each. 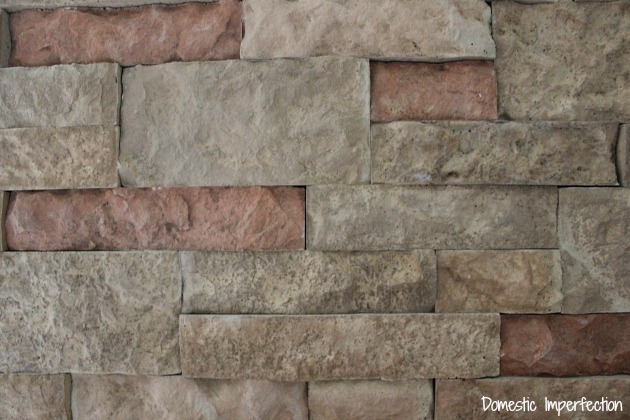 Considering the Airstone wall I did a year or so ago was about $500 and half the size (and included about a month of my labor while pregnant), this was a steal. And while I still really like that wall, the two just don’t compare. Your bedroom wall material was light enough to be suspended by its adhesive and the adhesive’s substrate (the drywall). The stone you’re using now is too heavy to not be a self-supporting veneer – it would overpower the adhesive, or fracture itself near the adhesive plane, or fracture the drywall. The metal masonry clips you saw are used to keep the veneer layer (the technical term is ‘wythe’) attached to the real structure, the studs + sheathing, so when the entire structure shifts slightly and repeatedly under a wind load or thermal expansion, the whole thing doesn’t come teetering down with a crash. 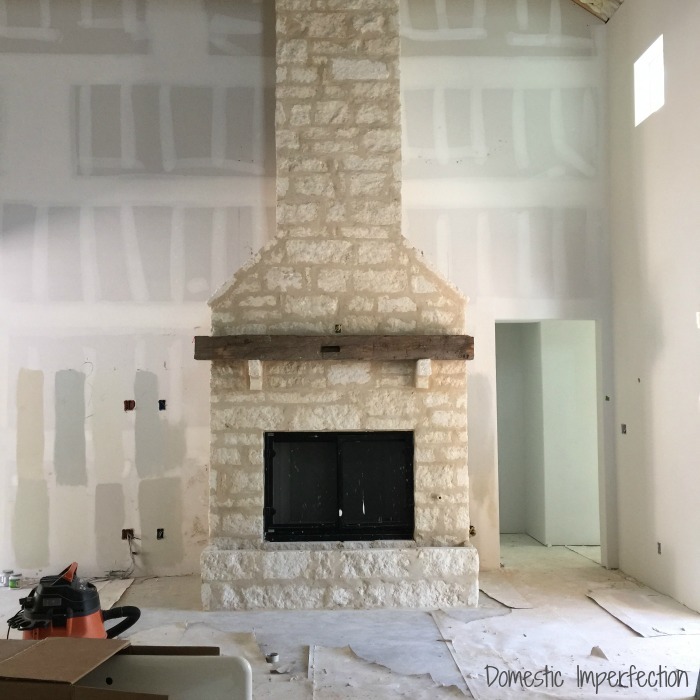 Comparing ‘modulus of rupture’ properties of the materials: Indiana limestone is only expected to be 1100psi in one spec I found, 1/2″ drywall looks like 750psi, compare those to 9400psi in ponderosa pine. 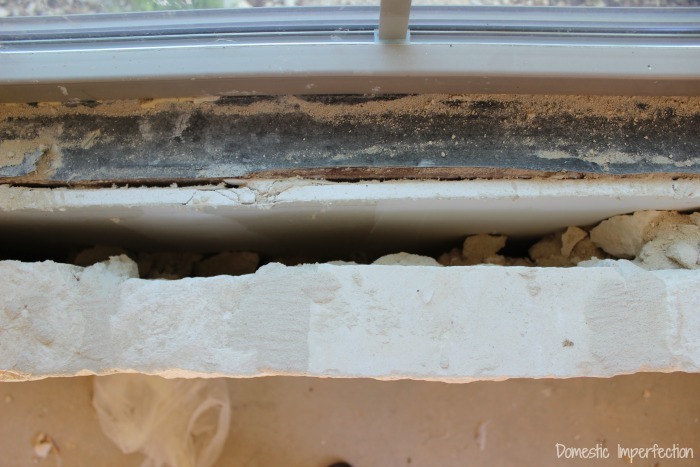 So if you tried to adhere a sizeable piece of limestone to 1/2″ drywall, I’d expect the weight of the limestone, upon any horizontal movement of the wall, to tear the drywall apart. Thank you for that explanation! I knew the drywall wasn’t strong enough to support the weight of the stone, I just wasn’t sure why there was such a large gap (why it’s not touching the drywall, but still self supporting). I figured moisture. Moisture is always a great guess, though on the conditioned space side of drywall you really shouldn’t have any… ;) However, they are doing the veneer exactly as they would for an exterior veneer, in which case moisture IS the answer…you want to be sure that there’s a clear gap between the veneer (which is somewhat porous to water) and the vapor barrior on the sheathing. So that what seeps through will run down the inside face of the wythe without sliding across any bridging detritus (as in your picture, but you’re indoors, so ok) but those clips to touch the sheathing. wow!!! The master bedroom wall looks amazing! I am not a stone girl myself but I really click with your style so I had to check it out. I have to say I think I’ve come around! It’s so light and airy! This is completely stunning. Perfect in every way! We’re currently doing a budget remodel on our house, which restricts some of our choices. But if we were to build a home from the ground up, I would choose this. Thanks for sharing your journey! We are having a work day out there on Saturday, I will have someone take a picture then and post it right here in the comments for you! 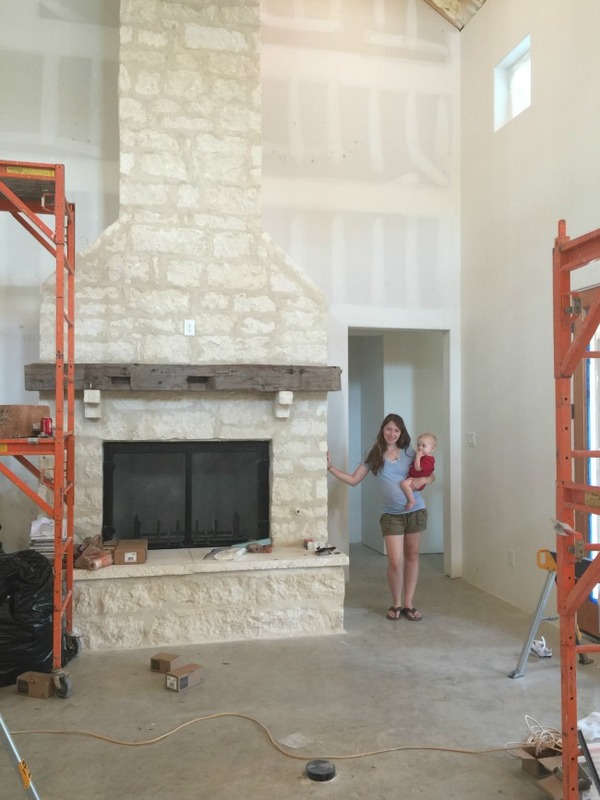 That fireplace is totally squeal-worthy! And you’re right, there’s just no comparison between the airstone and the real limestone. It’s totally gorgeous!! Okay, that stone is so over the top AMAZINGLY BEAUTIFUL!!!!!! I am a stone person myself, and I am loving all of your design choices – good move on putting it in the bedroom, it totally makes that wall, especially with the old wood toppers above the windows – stone & wood, a perfect combination. 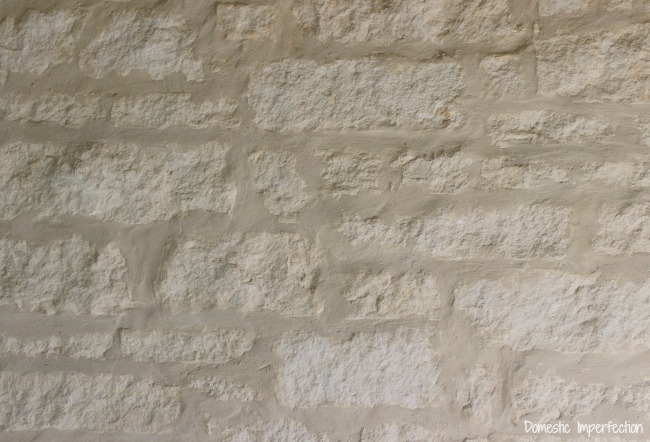 Love that beautiful stone wall in the Master Bedroom. Reminds me of the log cabin my grandmother lived in back in Maryland. Amazing how something so hard and earthy can give such a warm, cozy feel. 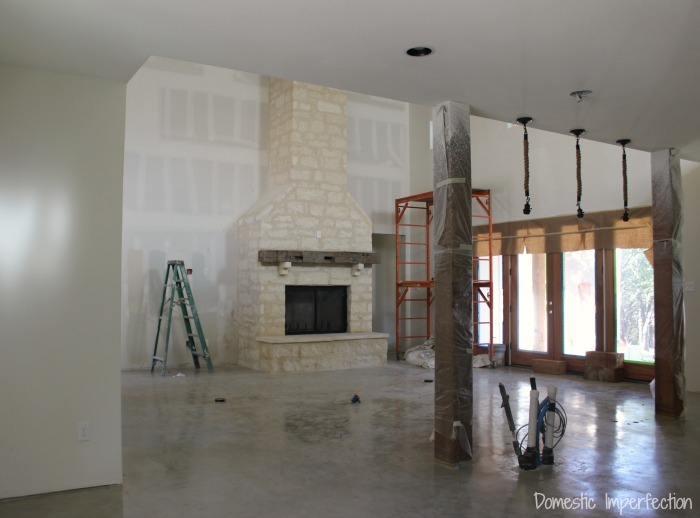 Your dream house is coming along beautifully! Holy hello! That looks absolutely stunning. Perfect rock and smear choice. And the vault in the master….perfection! We are getting ready to start building in SB, too. I may be needing some of your suppliers’/contractors’ names. 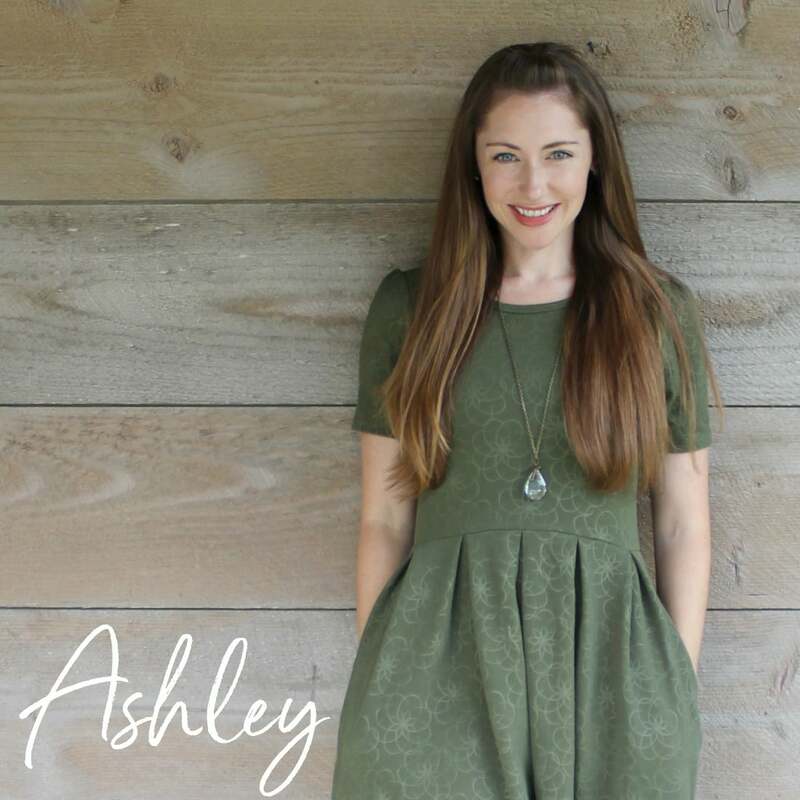 I’ll just tell them “make it just like Ashley’s”. 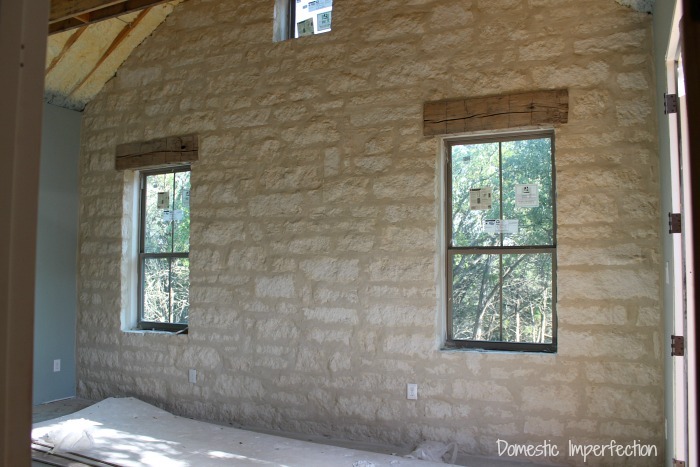 On a side note, what kind of window treatments will you do with that wood beam header over the window? Assuming you won’t want to cover it with curtains, etc. Do you already have a builder? Have we already talked about this via e-mail? For the windows I was thinking about doing a roman shade. I think that’s actually the only solution since I don’t want to cover the headers or drill holes in the rock. This looks fantastic! You were right about the mantel. Much better where it is now! I absolutely love this! This house is so unique, and it looks great! Congratulations on making so much progress! Keep it up! I like the color, texture and size of rock on the fireplace, can you tell me the name and where you purchased it? I love your bedroom wall! 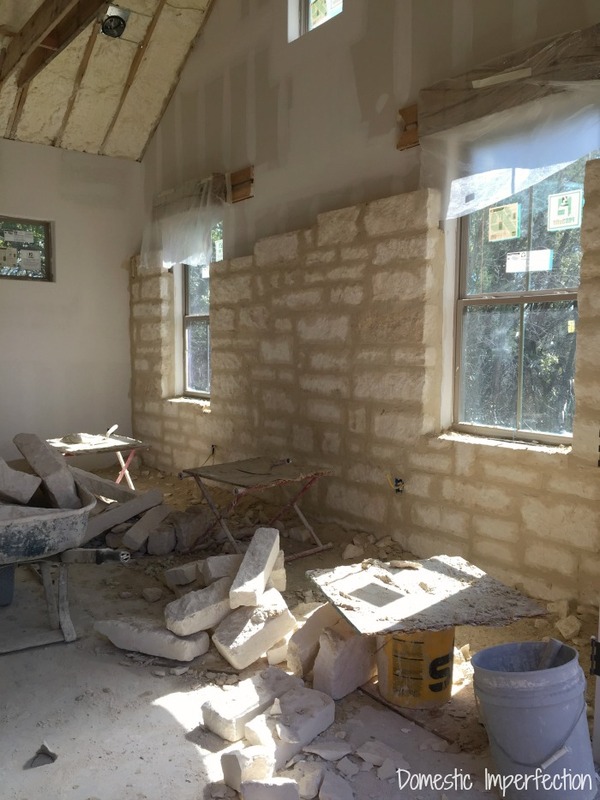 We are doing a remodel on a 1960’s California ranch home and I want to do an accent wall of limestone with a German schmear! Funny you mentioned air stone because we did a different project with it and it was good but by no means compares to the real thing. Can you tell me the name of it and where you got it? Thanks! Yes, airstone was good but the real thing is so much better! 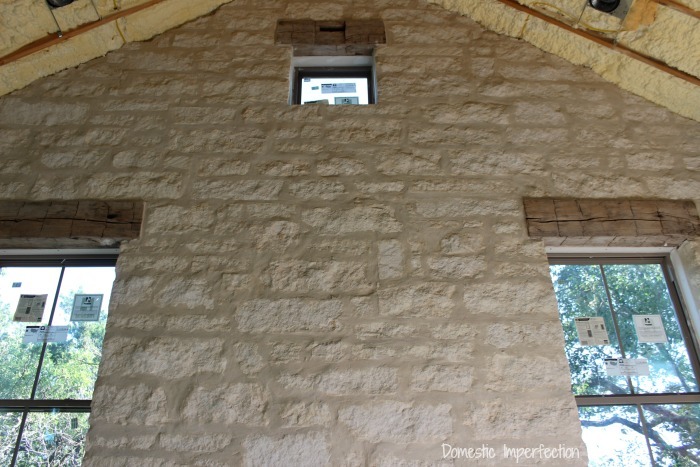 The limestone we used is just cream limestone in a medium chop. I don’t know where it’s from (the builder ordered it), but here in south central Texas it is the easiest to find, most generic stone you can buy. 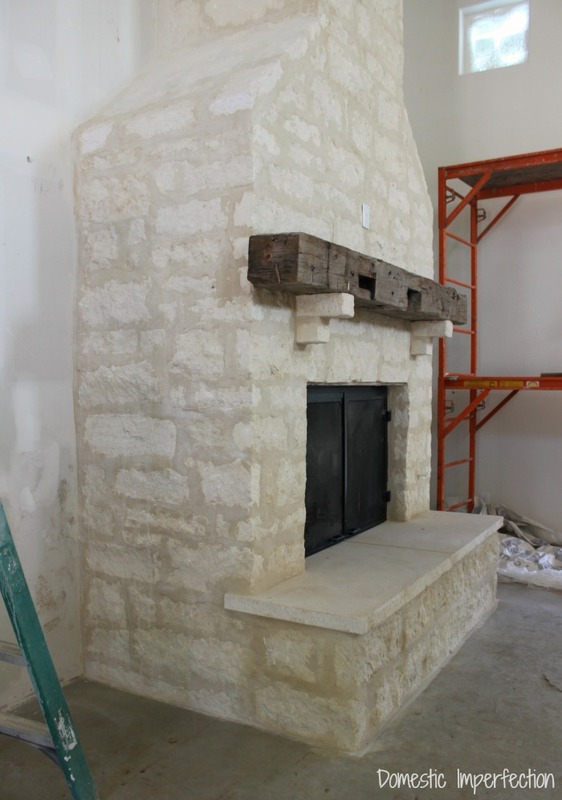 It is just cream limestone, around here it is the most common and least expensive option. I love this rock! Do you remember where you got it from? Yes! It’s a cream limestone chop from Cobra Stone. Wow! I’m so jealous. 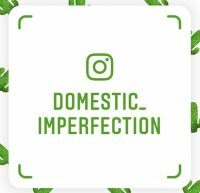 We too are in renovation. We are about to build our fireplace. Where did you buy your limestone rock and limestone slab? I loved seeing your fireplace. This is pretty much the direction we are hoping to go. 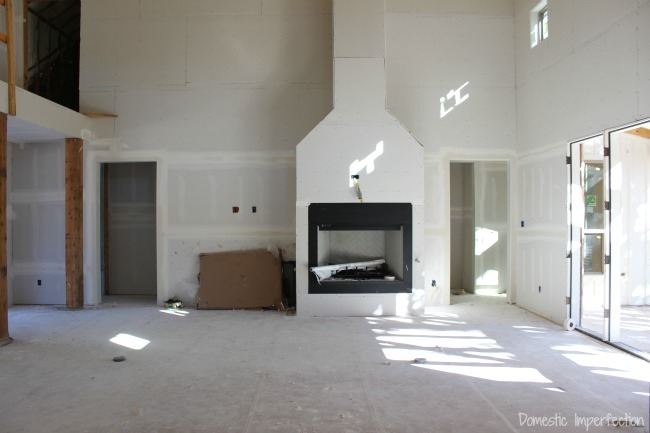 How big is your actual fireplace insert? What are your fireplace dimensions? Sorry for so many questions….I think I’m desperate. 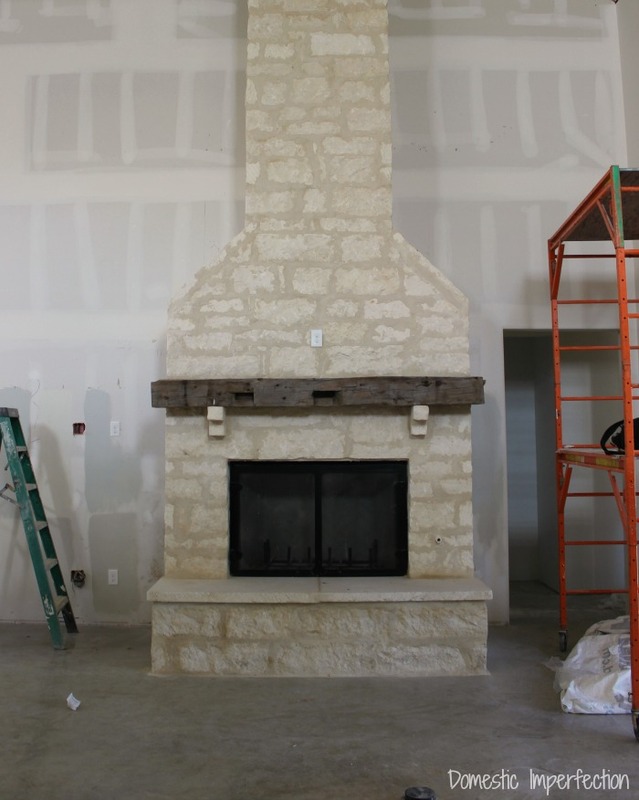 I have been thinking about our fireplace for over a year. Also — your bedroom is soooooo lovely!!! Can you tell me what the stone is ~ manufacture or color etc. it’s beautiful ! Thank you! It is cream limestone (3in 6in 9in), we got ours from Cobra Stone.